Grooming your hound helps keep it clean and healthy and minimizes the shedding of hair around the house. For showing purposes, grooming the hound is essential if it is to be competitive. Aesthetics apart a rough shaggy coat can obscure the underlying conformation of the hound to the judge who may have very little time to devote to an individual animal. 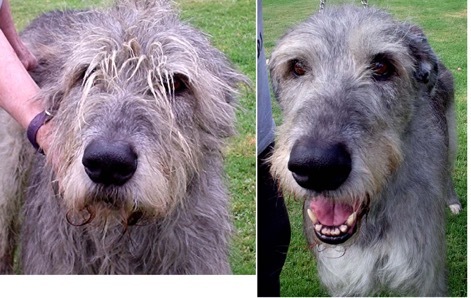 The best way to learn how to groom a wolfhound is to observe experienced owners doing it. 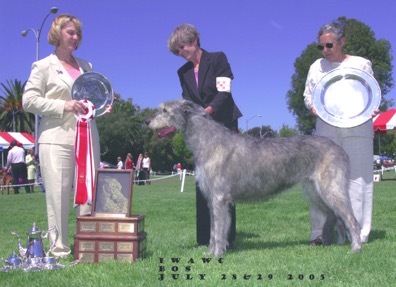 If a newcomer to the breed wishes to show their hound the breeder will often give advice as they want their hounds to appear to best effect in the ring. It is best to groom a hound several weeks before a show to avoid a newly-shorn appearance. The IWC occasionally holds grooming clinics and these are posted on this site and/or emailed to members. 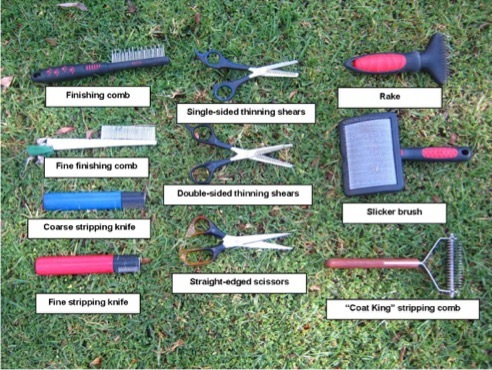 The photograph below shows some basic grooming instruments and their purpose. Finishing combs are used to remove debris and for those final touches just before the dog enters the ring. Stripping knives are used to remove excess hair all over the body, especially around the neck area and anywhere where the coat is thick and unmanageable. It can also be used to strip hair from the hounds ears to emphasize the small size and the double fold. Ear hair should ideally be stripped by gripping it between thumb and forefinger and pulled out without discomfort to the dog. Thinning shears are used to blend transitional lines and smoothly thin out bulky areas of the coat, such as the ruff that can develop around the neck. Single-sided shears remove coat rapidly while double sided shears are for a fine finish. A Slicker brush is used for removing loose and dead hair from the hound’s undercoat. A Stripping comb acts like a rake and is used to rapidly remove thick and/or matted coat. The following series of “before and after” photographs of the same dog ( Photos by kind permission of Mo Aiken, California USA.) 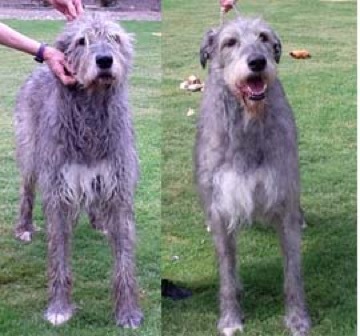 show the effect of good grooming on a hounds appearance. A lways like to strip when the dog is unwashed. The coat is more “sticky” and easier to grip when it still has natural oils on it. Once you have groomed then you can wash the dog and just tidy up afterward. Always, ALWAYS increase your hound’s confidence and sociability by touching him often. Regularly touching your dog gives you a chance to see if they have anything that wasn’t there before. This should be done weekly. Don’t decide to strip out a very hairy hound the day before a show. The coat will need time to settle and it is better to bath at least a week before a show to let the natural harshness return after shampooing. Start by stripping a little each day preferably when the hound is tired, as he will resist less. Remember, stripping should never be obvious so you should never see scissor or stripping knife marks in the coat. Too little stripping is far better than too much. Bald patches on your dog do nothing for his/her image or chances in the ring! Stripping will improve the quality of your dog’s coat and make him more comfortable. Finger and thumb stripping is the absolute best way to get the best results and the right look. Any tools such as stripping knives, Mars Coat King etc always cut the coat rather than stripping it out. Where possible use your fingers to strip and if you find it difficult use an old-fashioned rubber finger or a latex glove to give you grip on the hair. Always start by brushing (use a slicker brush) thoroughly then combing with a very fine-tooth comb. Make sure you brush absolutely everywhere. From between the toes to under the tail and around all those sensitive areas that get so mucky and matted. Then you can stand back and look at your dog and decide what needs to be tidied up. Always start on the head, specifically the ears. The ears should ALWAYS be hand stripped. They are a small enough area to work on without making mistakes or tiring your hands. Always check the inside of the ears and make sure they are clean and pink and not smelling. Do not use ear buds in your dog’s ear. A good ear cleaner is – 1/4mm Thayer’s witch hazel, 3/4 mm Aloe Vera Gel and 2-4 drops Tea Tree Oil. Remember – on the head, don’t strip forward of the line from the corner of the eye to the corner of the mouth down to the tip of the nose. If absolutely necessary trim a very, very long beard down. Move onto the neck, arguably the most difficult area to strip. The hair is thick and strong for good reason. It provides protection should it be needed in an encounter with a wolf. But, lots of hair on the neck makes it look short and stuffy. Use thinning shears or the Mars Coat King and then finish by hand stripping. The body usually requires less work. You are only going to tidy the dog’s outline. The only area that will need a bit of harder effort will be the dogs underline i.e. the belly area. Strip the hair tufts off the elbows. Strip the hair tufts off the hocks. Strip the big hair tuft at the base of the tail. The whole outline of the dog from tip of the nose to the end of the tail should be one continuous smooth curvy line. No dips or bumps. The outer edges of the feet should be neatened. Make sure the nails are cut often and kept short. This will improve the shape of the foot. If the dog has dewclaws still attached, don’t forget to trim the nails on these too. Some people do not like stripping their hounds and prefer a more natural shaggy look. However, if you do show your dog, then if the judge has to come to a final decision between two evenly matched dogs, the groomed dog may have the advantage.